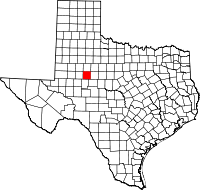 Mitchell County is a county in the U.S. state of Texas. As of the 2010 census, its population was 9,403. Its county seat is Colorado City. The county was created in 1876 and organized in 1881. It is named for Asa and Eli Mitchell, two early settlers and soldiers in the Texas Revolution. According to the U.S. Census Bureau, the county has a total area of 916 square miles (2,370 km2), of which 911 square miles (2,360 km2) are land and 4.8 square miles (12 km2) (0.5%) are covered by water. Mitchell County contains two reservoirs, Lake Colorado City and Lake Champion. As of the census of 2000, 9,698 people, 2,837 households, and 1,997 families resided in the county. The population density was 11 people per square mile (4/km²). The 4,168 housing units averaged five per square mile (2/km²). The racial makeup of the county was 74.52% White, 12.81% Black or African American, 0.41% Native American, 0.36% Asian, 0.02% Pacific Islander, 10.19% from other races, and 1.69% from two or more races; 31.03% of the population was Hispanic or Latino of any race. Of the 2,837 households, 30.60% had children under the age of 18 living with them, 55.60% were married couples living together, 11.40% had a female householder with no husband present, and 29.60% were not families; 27.50% of all households were made up of individuals, and 15.50% had someone living alone who was 65 years of age or older. The average household size was 2.48 and the average family size was 3.00. In the county, the population was distributed as 19.80% under the age of 18, 11.50% from 18 to 24, 30.70% from 25 to 44, 22.90% from 45 to 64, and 15.10% who were 65 years of age or older. The median age was 39 years. For every 100 females, there were 159.30 males. For every 100 females age 18 and over, there were 174.40 males. The median income for a household in the county was $25,399, and for a family was $31,481. Males had a median income of $23,750 versus $20,221 for females. The per capita income for the county was $14,043. About 15.00% of families and 17.70% of the population were below the poverty line, including 22.90% of those under age 18 and 20.90% of those age 65 or over. From 1921 to 1925, the Democrat Richard M. Chitwood of Sweetwater represented Mitchell County in the state House. He left his post to become the first business manager of Texas Tech University, which he had worked to establish in Sweetwater until the Lubbock site was chosen. He died in 1926 after a year as the business manager.